Mrs Shotton and Commander Pritchard after the lifeboat presentation. More than 1,200 members of the Co-operative Women’s Guild attended a meeting, at which a £5,000 inshore lifeboat was presented by their president, Mrs Shotton to Commander Pritchard, the RNLI’s district appeals secretary. The meeting at Portsmouth Guildhall was attended by members from Ipswich, Newcastle, Birmingham and Doncaster. 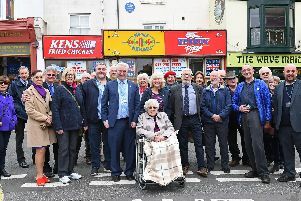 It was addressed by Mrs Shotton, Commander Pritchard, Portsmouth MP Frank Judd, the lord mayor of Portsmouth, Arthur Dann, and the mayor of Havant, Mr Derben. Mr Judd told the meeting the Co-operative movement was formed by people of courage, who showed the co-operation working at its best and that the RNLI had a sense of dedication throughout the organisation. Mr Dann congratulated those who had made the effort to travel to the presentation and that the Guild members must have been very enthusiastic in raising money for the RNLI which they adopted as their project the previous year. The inshore lifeboat, which went to Hayling Island, was displayed on Guildhall Square.